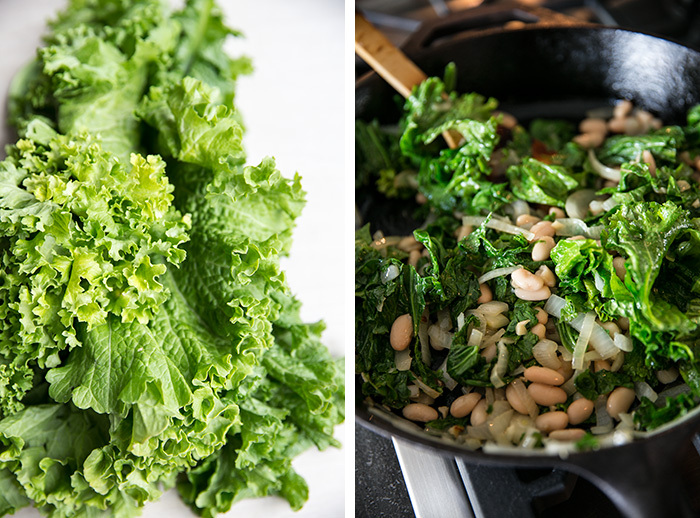 For our breastfeeding moms…leafy greens like spinach, swiss chard, kale and broccoli are filled with vitamin A, which is good for you and your baby. The benefits don’t stop there. They’re a good non-dairy source of calcium and contain vitamin C and iron. Green veggies are also filled with heart-healthy antioxidants and are low in calories. Using a fork, poke a bunch of holes in the skin of the potatoes. Then, drizzle lightly with canola oil. Place the potatoes on a parchment lined baking sheet, and bake for about 45 minutes (until they are cooked through). 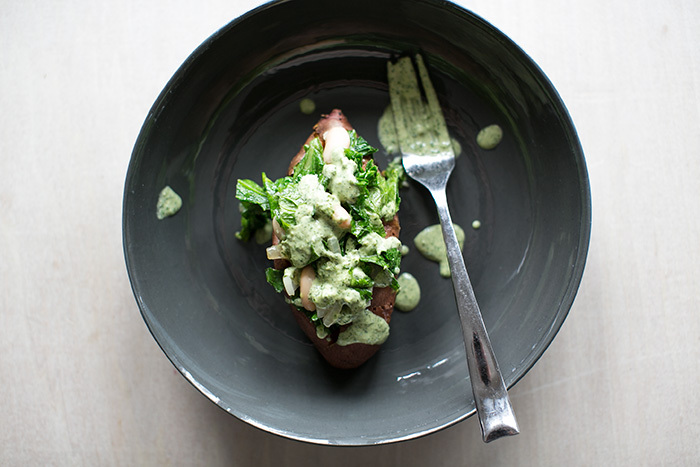 While the potatoes are baking, make the tahini and sautée the greens. 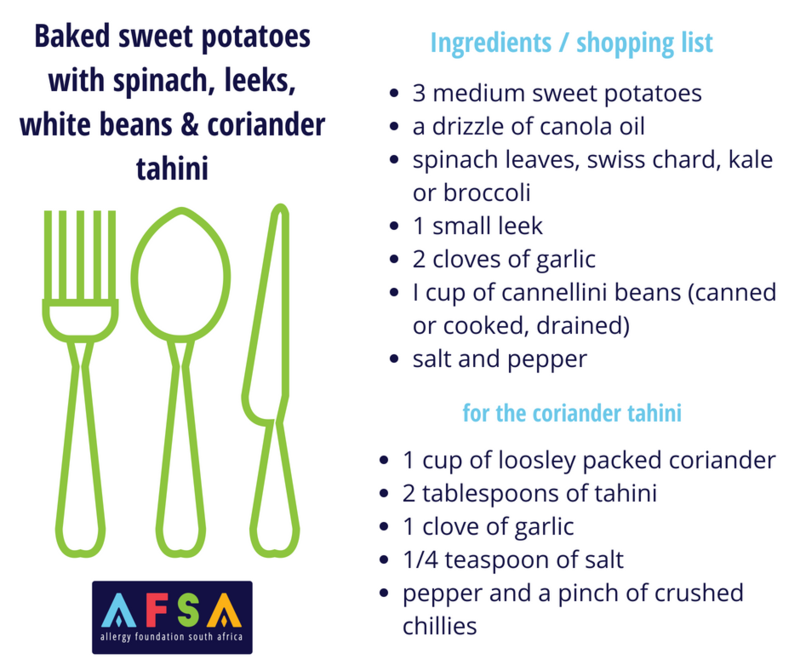 To make the coriander tahini, place all of the ingredients (besides the water) in a food processor and pulse until everything is combined. Then, while the food processor is running, add in the water slowly and continuously until you have your desired consistency. I like it to be a little runny so that it drizzles nicely over the potatoes. Set aside until you’re ready to serve. Then, sautée the greens. Place a couple of tablespoons of high-heat oil, such as canola oil, in a cast iron skillet over medium heat. Add in the garlic and the leeks and sautée for about a few minutes (until everything is soft but not browning). Then, add the greens. Toss to coat with the leeks and garlic and cook for about 2-3 minutes. I like the greens to have wilted slightly but not completely so they still have a slight crunch to them. Remove from the heat, add the beans and toss to combine everything. Using a small paring knife, make a slit across the top of the potato and open it up. Season lightly with salt and pepper and drizzle with some olive oil. Then spoon in the greens and bean mixture. I like to over-stuff them so the greens are scattered all over the plate. Then drizzle the coriander tahini over the top. These are best served immediately, and warm.